poles at the armature is the same on both magnets. What is it supposed to be? of the old auto brush/commutator generator used before alternators with diodes were used. The switching caused the AC current to stop the sine wave and flip the wires to maintain DC current. In the case of the UFO motor generator what is the commutator doing? to commutator to coil make any commutation switching to the proper coils? poles but no 3 pole explanations with two like magnetic poles near the armature. Hope this helps you to understand this different concepts. Thanks for the info and the pics. I will have to make a larger core as I don't seem to have enough room to stack all the wire on the sides going up to the fins. I was able to wind one layer but no room for second layer on the way back. What I asked was about "layers" not "filiar". I was using two strands to wind but like said above I don't have the room to wind the second layer coming back. I haven't made any real tests with the seven pole. I have to order another pair of motors to modify. I did just make two end caps that house the brush assy's. that can be rotated the amount between the stator magnets. (size of the gap) also have to shim one end to eliminate a slight vibration with new end caps. I'll post a pic for you later. 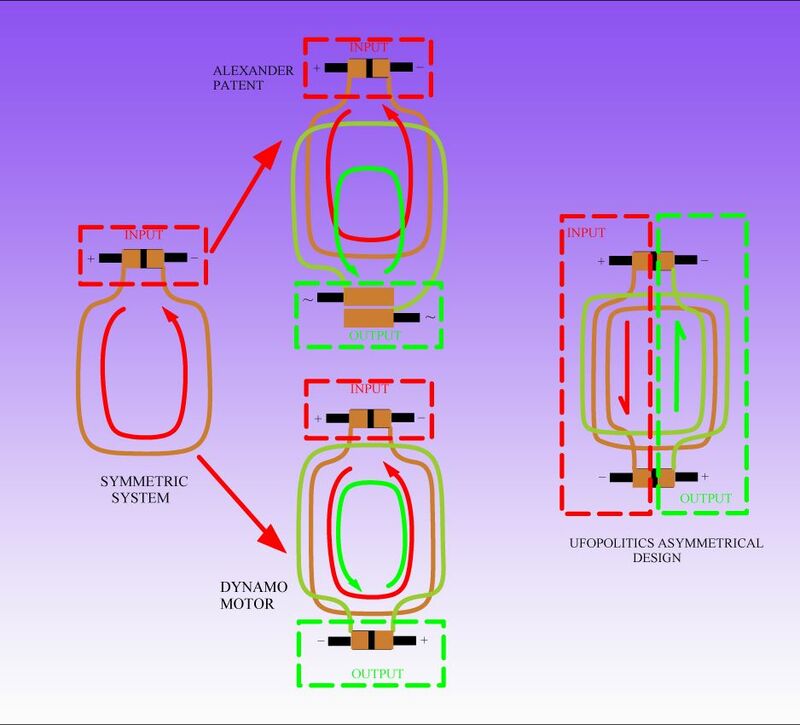 The magnetic poles are not the same in these dc motors. not alike and have different poles at the armature? If so this helps a lot. So far I have not seen a DC motor like that. I missed the great Asymmerty video - what an enlightenment!! And it goes way back to Maxwell. Here is a pic of my modified 7 pole and the custom made end caps that house the brush assy's. I can rotate the brushes or the stator the amount of the gap between stator magnets, due to the bolts running through the motor. Here will be some preliminary tests of different setups. Last edited by Gints; 08-28-2012 at 06:42 AM. I have the same motor and removed the inductors. It seemed to eat alot of amps so planned on rewinding. Haven't got back to that specific motor yet. Here will be my attempts to charge 12V battery with Ufopolitics Asymmetric Motor. The battery increase the voltage during the test. Last edited by Gints; 08-28-2012 at 05:27 PM. Wow!...I did not know you were such a great video "Producer-Director"!! Nice Edit, very nice... ! I am presenting here the simplest PWM (Pulse Wave Modulator) and Motor Controller that you could build, it is based on the very cheap 555 Timer...and it could work "Safely"with up to 12 Volts...without the need of a Voltage Regulator. This is the circuit I have been using all along in My very First Thread, I just added an LM317 Voltage regulator that is posted in my other Thread, it consist of the Transistor LM317, a couple of Electrolytic Caps and a couple of resistors...and I did it in order to apply a Higher Input that ranges from 24V to 36 Volts...But the basic circuit is this one here. The MOSFET (Not specified here) MUST be Ultra-fast Switchers, meaning, very low RdsOn (very low resistance in micro-ohms) as also OVER rated the Voltage/Amps You will be working here...and of course Heat Sinked and MUCH better if "Ventilated" with a small micro fan!! Here is the SAME Oscillator Circuit, expanded to More MOSFET's in Parallel for Heavier Currents handling as Heavier Machine Designs. I highly recommend this site for other great electronic free circuits as Switching Power Supplies and others...as Gary also sells parts there and the assembled circuits (for those that rather order them)...He is a very nice guy. Last edited by Ufopolitics; 08-28-2012 at 08:36 PM. Thank you for so nice words about videos......I use FinalCut to edit them. FC is very simple and easy to use for video edition. Also thanks for "hints". I will arrange these things tomorrow. I was previously tried to use the diodes (NTE576) at the motor output, but they heated up very quickly. Maybe it was because I was not disconnected the ferrite inductors from motor? Last edited by Gints; 08-28-2012 at 07:48 PM. I was trying before to use the diodes (NTE576) at the motor output, but they heated up very quickly. Maybe it was because I was not disconnected the ferrite inductors from motor? It is all my pleasure, they DO look VERY professional and very clean Videos! which is way too much...because it will attract back after dead center with power on. 5 pole is a much better because that would be 72 degrees plus 15 giving 85 degrees. Each coil passes by a motor brush then after 180 degrees it passes a generator brush. So I am making a lidmotor style simple 2 pole motor to get he wired up right and working. Lying down to rest today with my brain turned on brought me to this understanding. Last edited by norman6538; 08-30-2012 at 01:17 AM. Norman, did you physically build a 3 pole motor or you just are guessing? What masterblaster is referring to is that if you built a three pole setup you would not say or think that it is weak in any way and in fact those little dudes have way more power than they were built for. UFO has stated many times that the three pole is a sturdy creature. Try one, you will like it. It is also the easiest to wind. I can testify to the fact that the 3 pole does indeed work! And quite well! very simple Lidmotor as a starter..
UFO said 3 pole is better than a Five pole, I have already destroyed the copper brushes for excessive use. Thats the easiest configuration to do and test, I have replicated 3 volt motors and 12 volt motors both of them are 3 poles and working excellent. we see as too much heat. I Believe that one coil/strand of wire between 1 pair of brushes is divided in half still one strand half is connected to a commutator segment and wound CCW looking from the outside of the Armature and still the same strand the other half is wound CW looking from the outside of the armature still only one strand and this end of this single strand is connected to the corresponding Commutator segment of the other commutator this single wire is Used both halves as a Generator or both halves as a motor. At any time when on one end of the armature this strand/ Commutator segment is connected to a Motor brush the corresponding commutator segment on the other end of armature to the corresponding power brush so that this one strand is energised causing half of the single strand to be a magnetic South and at the same time the other end of the single strand is a North pole when the brushes leave these commutator segments the poles are immediately reversed and therefore help to pull/push the armature. Depending how wide the brushes are they cover more than the one commutator segment pair and therefore more than one strand is energised at any one time. When the commutator segments come in contact with the Generator brushes the exact opposite takes place and therfore the motor is balanced magnetically and should run smooth. This is my understanding as to what takes place If I am wrong I am sure I will be corrected. I have started to test your motor feeding with PWM signal. Can you please explain me the purpose and advantages of using antiphase or opposite phase signals to feed your motor? Last edited by Gints; 10-16-2012 at 12:45 PM. hear anyone say the coils had different winding directions. Is that true folks? with two pole where its dead on. Norman...Norman...it has been less than 24 Hours you have gotten to find about My Machines...it's been less time than that... you are "starting" to "understand" them...and yet...You are trying to focus on "possible mistakes, errors" with this Machines Design? I honestly consider your "late approaches" a bit daring, ranting...criticizing what you have absolutely NO IDEA CONCLUDED YET...Or very INCOMPLETE. My "counseling" is that you "rewind" your tape...and go back and re-read everything again, and again...before coming to any wrong conclusions that could get me upset...please. I have been "nice to you" so far...don't "push your luck". Last edited by Ufopolitics; 08-30-2012 at 12:54 PM. the coil/commutator/btush timing stuff. I'm cogitating/thinking about the cw/ccw point. I did nothear anyone say the coils had different winding directions. Is that true folks? Take a length of wire say 1 meter long wind it CW around a round piece of pipe wood broomstick or whatever as a core say 20 turns. and stops at its trailing edge. There are "NO PROBLEMS AT ALL WITH THIS MACHINES"...The "only problem" is that You Do NOT understand them right. I have developed this machines for many years back...THINK, THEY DO NOT NEED ANYONE...to walk in here trying to make ANY IMPROVEMENTS...OK?! Return back...get the "Straight Road" and I will explain...or keep going as you please....You will hit a solid brick wall. Last edited by Ufopolitics; 08-30-2012 at 01:30 PM.